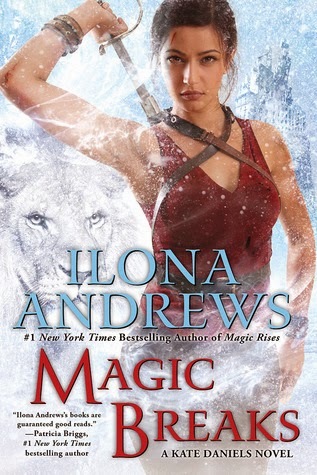 MAGIC BREAKS, the latest Kate Daniels book by Ilona Andrews is out July 29 and includes the appearance of a character I've been waiting to see since book 1. You can read my review here. Note: Slight spoilers if you are new to Kate. In book 7 Kate finally comes face to face with her father, Roland. A powerful being, he is ruthless yet magnetic. He might destroy you, but chances are most will willingly flock to that destruction. In honor of his appearance, it's time for Mind Your Elders, two drinks featuring my current favorite liqueur, Elderflower. This liqueur is smooth, flowery without an overbearing perfume. For me, those smooth liqueurs are a bit more dangerous. A shot of whiskey leaves my throat on fire, while a shot of Elderflower is velvety goodness. Much like Roland, intense, infinitely attractive, yet can pack a wallop in big doses, like when his mighty horde is coming to claim your city. Today here's a refreshing Cucumber Mint Elder-Gin Fizz and a Cherry-Lime Elder-Gin Fizz. I've found the pairing of Elderflower and Gin to go very well together. Both of these are my current go to drinks for these hot summer days. 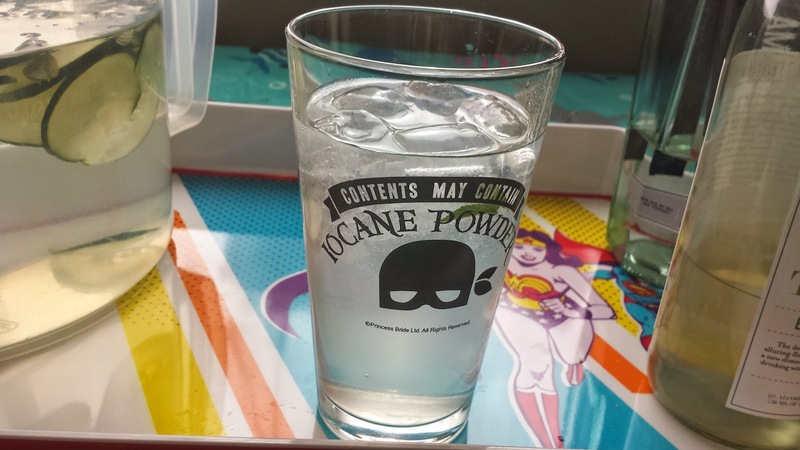 I'm using my favorite "Iocane Powder" glassware from ThinkGeek. Considering Kate's favorite book is THE PRINCESS BRIDE, it seemed appropriate. First, you need to infuse the water. This is pretty easy (and tasty on its own), but should be done the day before to get the best taste. 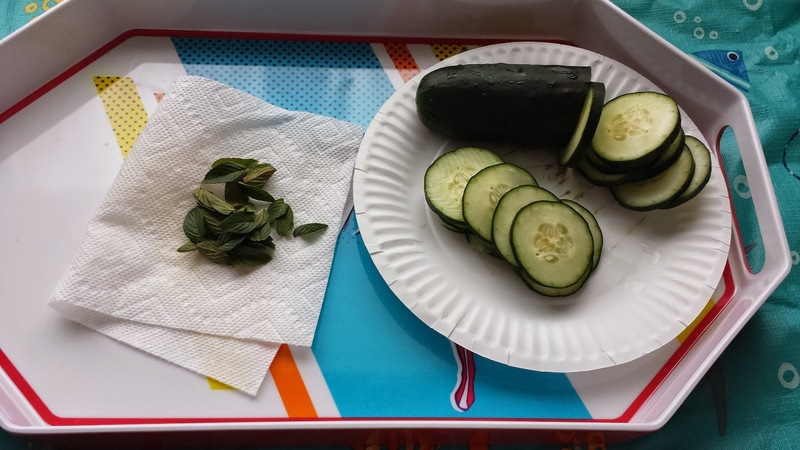 I used about a small handful of mint leaves from the garden, washed and patted mostly dry, and enough thinly sliced cucumber to fill the bottom of the pitcher. 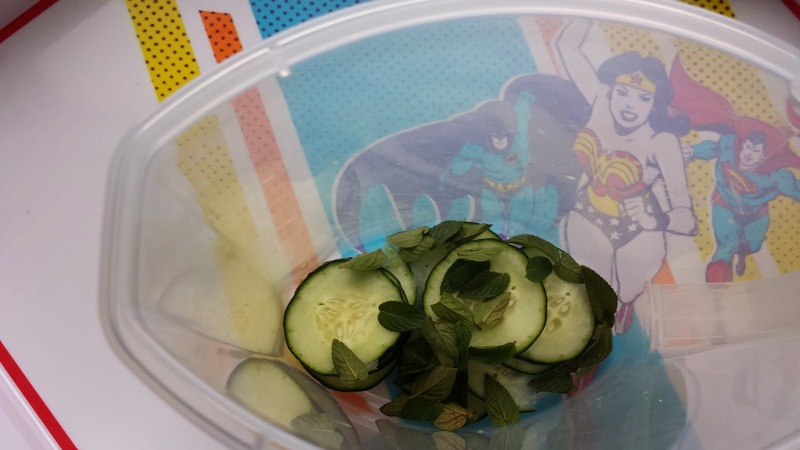 Put in the mint and cucumber, cover with water (I did about a quart and a half), chill. 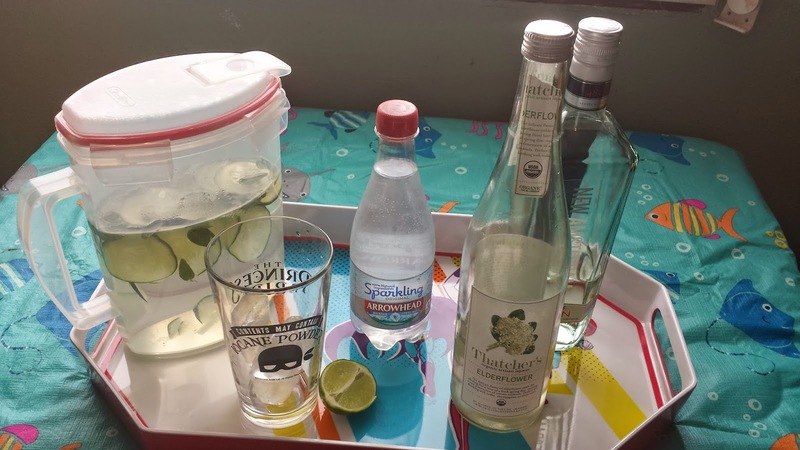 Squeeze the lime into the glass, fill about halfway with the infused water, add a shot of elderflower and gin (more or less depending on your mood), top with sparkling water/club soda. 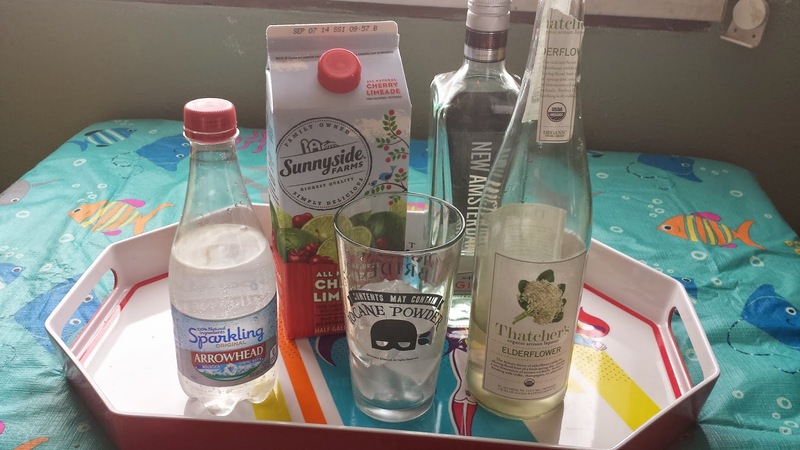 If you want a milder drink, omit the gin. 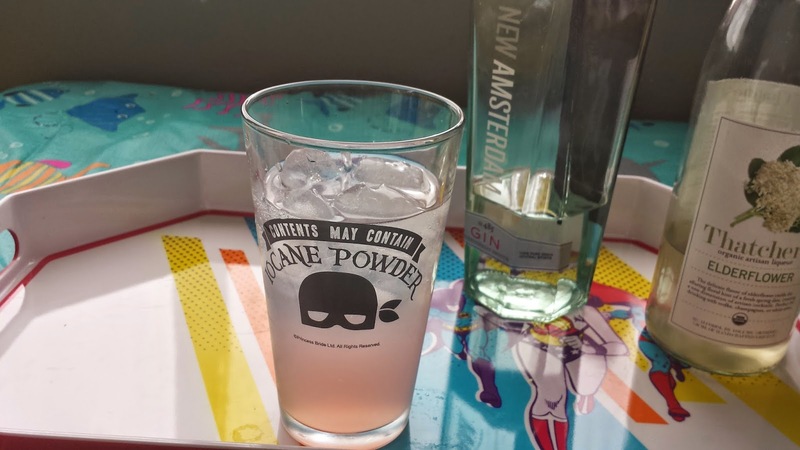 Fill glass halfway with cherry limeade, add a shot of elderflower and gin (more or less depending on your mood), top with sparkling water/club soda. Cheers! 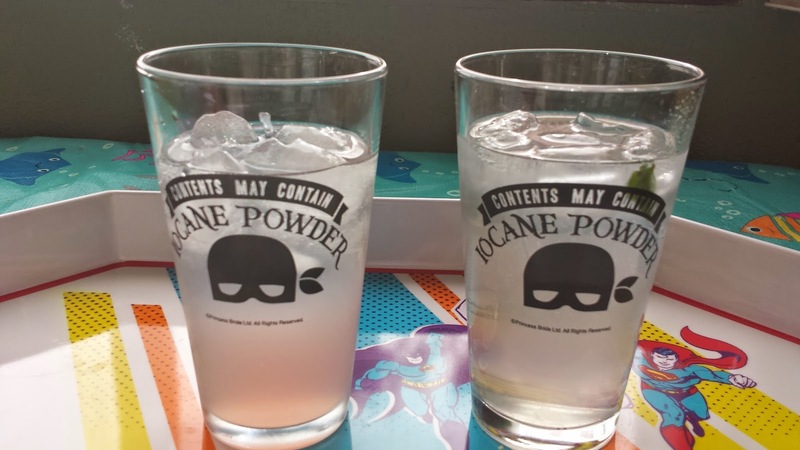 Can you guess which one contains Iocane powder? Now I'm going to sit back and reread a few of my favorite scenes from MAGIC BREAKS.